Effect Restores HP and FP and cures status ailments. 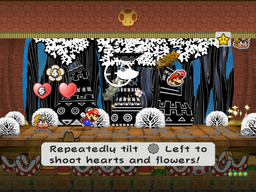 Sweet Treat (referred to as Tasty Treat in the instruction manual) is the first Special Move Mario learns in Paper Mario: The Thousand-Year Door. Mario gains this power the first time he travels to The Thousand-Year Door, when he holds the Magical Map atop the pedestal. The move restores the Heart Points and Flower Points of Mario and his current partner, and cures all status ailments. The Action Command of this move requires the player to rapidly tilt the Control Stick to the left to make Mario throw miniature Crystal Stars at icons falling down slowly from the top of the screen. The icons that fall are Mario's face with a heart, his partner's face with a heart, a flower, and a total of 3 Poison Mushrooms. Each one hit with a star restores a point to the appropriate stat, but if a Poison Mushroom is hit, Mario becomes unable to throw any stars for a few seconds. The move uses a single point of SP. This page was last edited on May 3, 2018, at 09:33.